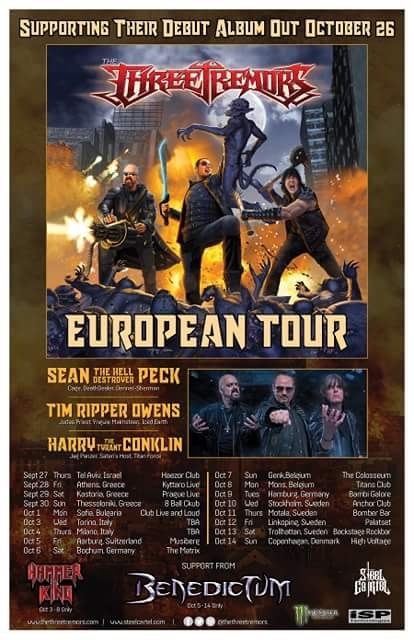 The Three Tremors – the new supergroup featuring Tim “Ripper” Owens from Judas Priest, Iced Earth and many others, Harry “The Tyrant” Conklin from underground legends Jag Panzer, and Sean “The Hell Destroyer” Peck from Cage, Death Dealer and Denner/Shermann – will release their self-titled debut album this winter. They have released a teaser for their next lyric video, for the song “When The Last Scream Fades“. Check it out below. Jimmy Kay from Canada’s The Metal Voice recently interviewed the band. BraveWords recently premiered the first lyric video, “Invaders From The Sky”, from the upcoming debut album. The Three Tremors nourish in heavy metal anthems, and feature the illustrious chops of guitarist Dave Conan Garcia, whose tenacity fuels the fire, allowing the music to naturally flow in complimentary tone. Second guitarist Casey Trask picks up the pace and pushes the boundaries alongside bassist Alex Pickard, who highlights a melodic sensibility giving character to the overall tonality. On drums, the thrash machine Sean Elg adds in his perfectly placed fills and signature double bass patterns. 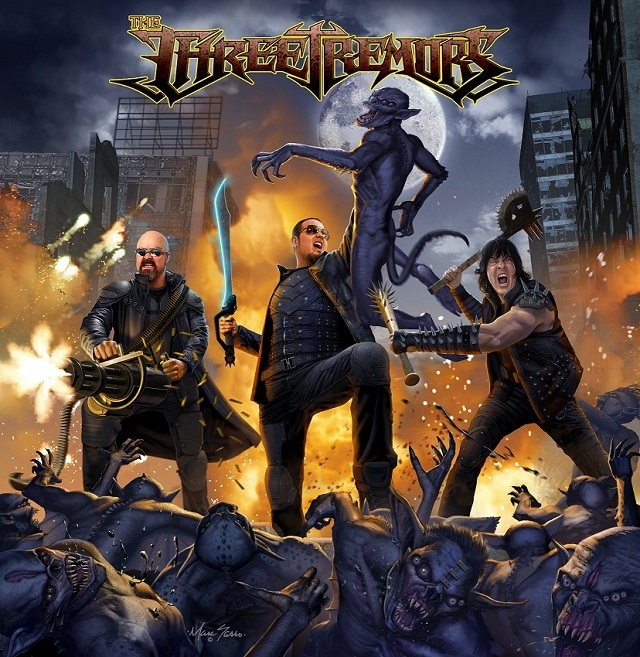 The Three Tremors self-titled debut album will feature 12 new songs that depict monumental stories of time honored heavy metal themes as written by Sean “The Hell Destroyer” Peck, focusing on original concepts to highlight three of the most revered and relentless voices in heavy metal. The Three Tremors will court you in to an entirely new atmosphere unlike any group before! Prepare for the most thrilling heavy metal record to date! Read more at their Pledge Music page here. The The Three Tremors debut is due out this winter. European tour dates have been announced for September / October 2018. The complete itinerary can be found here.